GARDENA >> The investigation continues into a solo-car crash on a freeway transition road in Gardena early Sunday that left three young men and a young woman dead. The identities of the four victims of the 3:30 a.m. crash on a winding cloverleaf interchange between the 110 and 91 freeways were not released Sunday pending positive identification and notification of their families, Los Angeles County coroner’s officials said. California Highway Patrol officials described the driver of the 1991 Ford Probe as an 18-year-old Inglewood man. His passengers were an 18-year-old Compton woman, an 18-year-old man whose hometown was not available and another man whose age and city of residence were unknown. “According to witnesses, a blue Ford Probe traveling at a high rate of speed, northbound Interstate 110, transition to westbound State Route 91, lost control and struck a support pillar,” Officer D. Howell’s of the CHP’s South Los Angeles-area office said in a written statement. Paramedics pronounced all four occupants of the car dead at the scene just after 3:45 p.m., he said. No further details were released. The cause of the crash is being investigated by a CHP Multidisciplinary Accident Investigation Team, which specializes in major collisions. Any witnesses, or anyone with information can reach the CHP’s South Los Angeles-area office at 310-516-3355. LA HABRA >> Police are seeking a man who robbed another man at gunpoint in the parking lot of a La Habra shopping center late Saturday, officials said. The crime unfolded shortly after 7 p.m. as the victim was walking through a parking lot of a shopping center in the 900 block of Harbor Boulevard, just north of Whittier Boulevard, La Habra police Sgt. Jeff Baylos said. The robber approached the victim, brandished a handgun and demanded money, the sergeant said. The gunman then patted the victim down and grabbed about $200 in cash and a cell phone from his pocket. Baylos said the robber was last seen getting in to a pickup truck, possibly a black Ford Ranger, which sped off. Police described the robber as a Latino man, about 5 feet 2 inches tall, with long hair and wearing a hooded sweat shirt. MARYLAND >> A 32-year-old Altadena man died over the weekend after being shot in a suspected hunting accident in Maryland, authorities said. Vincent Cavallo died at the scene of the shooting, which took place about just before 9:30 a.m. on Saturday on a private piece of land in the Thurmont area, near Camp David, Maryland Natural Resources Police spokeswoman Candy Thompson said. An autopsy was yet to be completed by coroner’s officials, but the initial investigation indicated Cavallo accidentally shot himself in the head with a .30-06 hunting rifle, she said. It appeared he either tripped or dropped his rifle when the firearm discharged and struck him in the head, Thomson said. He was on his first hunting trip with his uncle when the fatal mishap occurred, she said. The two men had been separated for about half an hour as they searched for deer when the uncle heard a shot ring out, according to Thompson. The uncle initially thought his nephew had taken a shot at a deer. But when the man sought out his nephew, he found him lying mortally wounded. “It was his first hunt. He was excited,” Thompson said of Cavallo. He had recently completed a hunter safety course in California, which his uncle insisted upon before taking him on the trip. But “to all indications,” Cavallo was carrying the loaded rifle with the safety off, she said. Use of the rifle’s safety likely could have prevented the incident. The suspected accidental discharge was not the only one reported Saturday, Thompson said. Another hunter suffered a gunshot wound to his leg in a similar incident. Saturday marked the first day of Maryland’s two-week, modern firearms deer hunting season. PASADENA >> Police investigating reports of gunfire in a residential neighborhood in Pasadena early Sunday found a car that had been struck by bullets, authorities said. The shooting took place about 12:05 a.m. in the 600 block of Palisade Street, Pasadena police Lt. Mark Goodman said. Officers found a parked car with bullet holes in it, but no injured people, he said. No witnesses to the shooting came forward, and no suspect description was available. LONG BEACH >> A man and woman died and two other people suffered injuries in two separate crashes reported within minutes of each on the same stretch of the 605 Freeway in Long Beach early Saturday, authorities said. Both crashes took place shortly after 1 a.m. on the northbound 605 Freeway, just south of Carson Street, California Highway Patrol officials said. The first collision occurred at 1:05 a.m. and allegedly involved a drunken driver, officials said. A 21-year-old Cerritos man was driving a 1991 Honda Civic, with a 35-year-old Norwalk woman riding as a passenger, when it veered from traffic lanes, Officer C. Summers of the CHP’s Santa Fe Springs-area office said in a written statement. Officers determined the driver was under the influence of alcohol and arrested him on suspicion of DUI, Summers said. His name was not available Saturday afternoon. He was treated for injuries described as minor. The second deadly crash was reported at 1:13 a.m. and claimed the life of 35-year-old Trevor Jacob Fike of Huntington Beach, Los Angeles County Department of Medical Examiner-Coroner Investigator David Smith said. He was driving a 1998 Ford when he became involved in a solo-car crash that left his car disabled between the fast lane and carpool lane of the freeway, Officer C. Black of the CHP’s Santa Fe Springs area office said in a written statement. He got out of his car. “The Ford was struck by a 2006 Volkswagen traveling in the No. 1 lane of Interstate 605 northbound,” he said. The driver was also hit and was pronounced dead at the scene by paramedics, officials said. A 37-year-old Bellflower man driving the Volkswagen suffered “major” injuries in the crash, Black said. A 23-year-old Bellflower woman who was riding as a passenger in the Volkswagen was treated for minor injuries. Anyone with information on either crash is urged to contact the CHP’s Santa Fe Springs-area office at 562-868-0503. NORWALK >> A driver died and his passenger was critically injured when a sedan slammed into a building in Norwalk early Saturday, authorities said. The crash took place about 1 a.m. at Funston Street and Front Avenue, Los Angeles County sheriff’s Lt. Daniel Gillespie said. A man in his early-20s was at the wheel of a 2002 BMW 540i when he lost control while rounding a curve along northbound Funston Street, just south of Front Street, and veered to the left, according to the lieutenant. The car slammed into the side of a building formerly used as a Veterans of Foreign Wars of the United States post, officials said. Paramedics pronounced the driver dead at the scene, Gillespie said. His identity was not available Saturday afternoon. Los Angeles County coroner’s officials had not record the death, coroner’s Lt. David Smith said. The passenger, also described as a man in his early-20s, was hospitalized in critical condition, Gillespie said. Anyone with information can reach the sheriff’s Norwalk Station at 562-863-8711. PICO RIVERA >> A Pico Rivera man bit a piece of another man’s face off and tried to throw another off of a second-floor balcony during a dispute between neighbors at an apartment complex on Friday, officials said. Jose Luis Pena, 38, was booked on suspicion of assault with a deadly weapon and mayhem, legally defines as depriving another person of a part of their body, disfiguring a body part or rendering it useless, or cutting or disabling of the tongue, eye, nose, ear or lip, according to Los Angeles County sheriff’s officials and booking records. The violence unfolded about noon at an apartment building in the 7400 block of Rosemead Boulevard, sheriff’s Lt. Sergio Escobedo said. Deputies responded to a report of a fight among neighbors when they learned Pena had attacked on neighbor by trying unsuccessfully to throw him over the railing of a second-story balcony. Pena then turned his attention on another neighbor. “He attacked (the second neighbor) and bit of a piece of his cheek,” the lieutenant said. Deputies took Pena into custody without a struggle. It was unclear how the dispute began. According to county booking records, Pena was being held in lieu of $130,000 bail pending his initial court appearance. 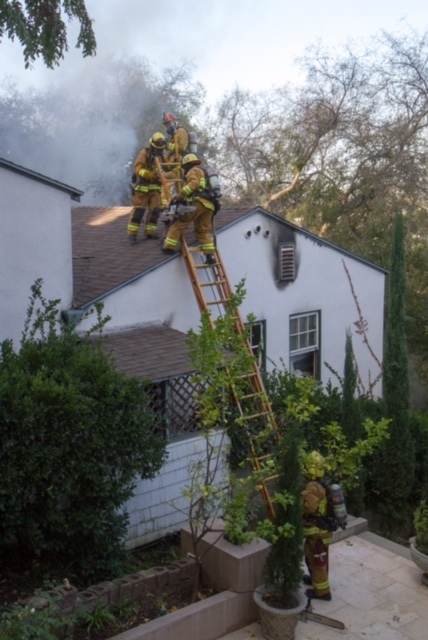 PASADENA >> An elderly woman died in a house fire in Pasadena Friday morning despite a neighbor’s “heroic” efforts to rescue her, authorities said. Neighbors called 911 at about 8 a.m. after noticing smoke coming from the two-story home in the 300 block of Redwood Drive, Pasadena Fire Department spokeswoman Lisa Derderian said. A neighbor tried to rescue the trapped woman, but was driven back by the intense house fire. The man, who is in his 40s, suffered apparently minor burns from the fire but declined to be taken to a hospital. Firefighters arrived to find flames rising from the home, officials said. Neighbors told firefighters that an elderly woman who lived alone at the home had been heard yelling for help from within, officials said. “A neighbor who was walking by, heard a female screaming inside and saw light smoke coming from the rear of the structure,” Pasadena Fire Chief Bertral Washington said in a written statement. “After recognizing there was a fire, the neighbor heroically made entry through the front door and attempted to pull the elderly resident to safety. “He was met with tremendous heat and a wall of fire in the room she was lying in. The victim was pulled out of the fire room, but not before the neighbor sustained minor burn injuries,” Washington said. Pushed back by the flames, the man called out for help from other members of his family, who rushed to try to help as well. Firefighters found the woman in the home as they worked to extinguish the flames, Derderian said. She was pronounced dead at the scene. Los Angeles County coroner’s investigators had yet to identify the victim Saturday. The identification process was expected to be delayed due to the charred condition of the body, officials said. But the elderly woman believed to be the home’s lone resident remained unaccounted for Friday afternoon. Fire investigators identified multiple possible causes of the fire, but had yet to isolate the specific cause. Investigation into the fire cause identified overloaded wiring, excessive use of extension cords and power strips, a portable heater, electric blanket, candles and smoking materials in the room of origin, fire officials said. The bottom floor of the two-story home is partially underground, which contributed to “very challenging” and “very stubborn” fire, Derderian said. Firefighters declared the fire “knocked down” about 20 minutes after it was reported. Firefighters were able to prevent the fire from spreading to any other nearby homes or vegetation. 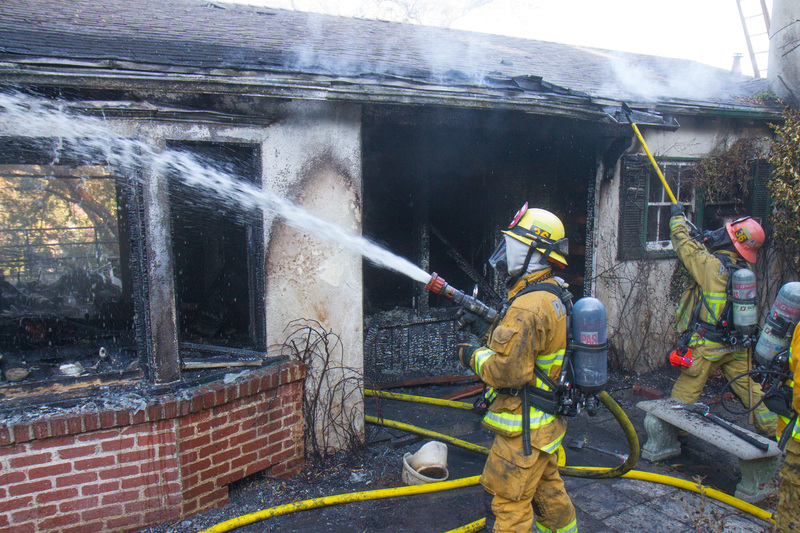 The deadly fire remains under investigation by a newly-formed multi-agency arson task force comprised of investigators from Pasadena and other area fire departments. 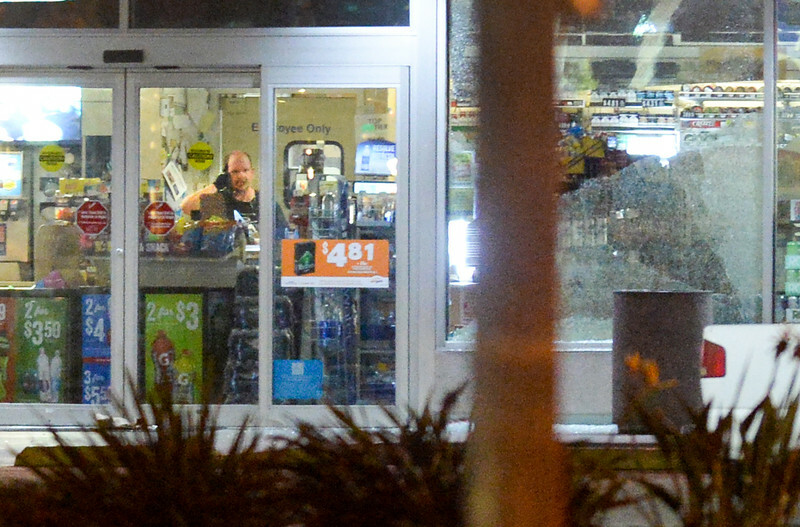 LA MIRADA >> Coroner’s officials have released the identity of a 45-year-old La Habra man who was fatally shot by SWAT deputies following a 3-and-a-half-hour standoff at a La Mirada gas station early Tuesday morning. Mark Daniel Sly died at the scene of the deputy-involved shooting, which took place just before 1 a.m. at the ampm convenience store and ARCO gas station at 13550 S. Beach Blvd., Los Angeles County Department of Medical Examiner-Coroner Assistant Chief of Operation Ed Winter said. He fired at deputies at least twice during the standoff, which began with a report of a robbery in progress at the business, Los Angeles County sheriff’s officials said. Deputies responding to the robbery encountered Sly, who matched the suspect description, standing at the front door of the convenience store armed with a handgun, Deputy Caroline Rodriguez of the sheriff’s Information Bureau said. Sly refused commands to drop his gun and surrender, and deputies summoned a SWAT team and a crisis negotiation team to the scene. At one point during the hours-long standoff, the suspect fired at deputies through a front window of the business, Rodriguez said. A deputy returned fire through a window, but it was unclear of Sly was wounded in that exchange. Sly exited the store with a handgun and again fired on SWAT deputies at 12:55 a.m., officials said. Deputies fired back, fatally wounding Sly. The investigation remains ongoing, and anyone with information is asked to contact the sheriff’s Homicide Bureau at 323-890-5500. Tips may also be submitted anonymously to L.A. Regional Crime Stoppers at 800-222-8477.